Remember that frustrating, vague hint of a tagline, "Your Mind is the Scene of the Crime"? Well, Inception delivers on that. Christopher Nolan's films habitually focus on an edgy concept, what some might call a "hook", and then flesh out that germ of an idea into a full-fledged narrative. Following, his debut picture, concentrates on someone who gets life-meaning pleasure out of stalking people, while Memento zeroes in on a "detective" with short-term memory loss trying to solve the case of his wife's murder -- while using his tattooed body like a permanent Post-It note. After years of scurrying around a Chicago-inspired Gotham City with his Batman universe, Nolan has earned both the prestige and studio confidence to do what he's done with his cerebral independent thrillers, only on a much grander scale. In steps Inception, an idea he's had shoved in the oven of his mind for nearly ten years. Again, Nolan concentrates on an involved idea; this time, he uses the expanses of our dream-space and subconscious as a physically accessible, malleable location, one pliable enough to build Escher-like mazes or vaults for secrets. And he builds from there. With cinematic skill in full-force, rooted in a script Nolan constructed like the dreams in his picture and a fine cast populating the reality-bending expanses, Inception has only one opponent: its own ambitiousness, also its core strength. The story around it focuses on a somewhat traditional heist setup, with mind-bandit Don Cobb (Leonardo DiCaprio) as the organizer and all-powerful "extractor". Along with his partner Arthur (Joseph Gordon-Levitt), Cobb specializes in a specific type of thievery that involves a more literal form of stealing "intellectual property", meaning he breaks into others' dreams via a briefcase-sized computer and boosts information. But Cobb's harboring secrets; along with not being allowed to see his children back home, his wife Mal (Marion Cotillard) -- a mere projection of her from Cobb's psyche -- invades the dreams and complicates his jobs. 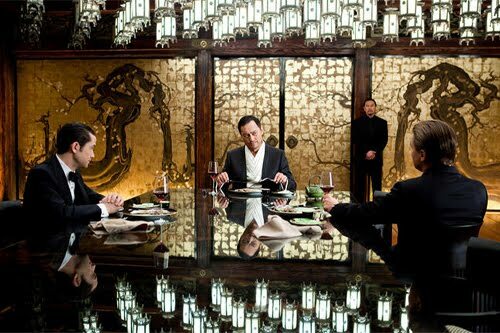 So when energy tycoon Saito (Ken Watanabe) arranges a dangerous, high-profile job that'll allow Cobb to return home as payment, he's not able to decline -- even if it involves inception, or the taboo "planting" of an idea, instead of theft. It could be argued that Inception's ideas have been cobbled together from a slate of influences, from the idle-mind manipulation in The Matrix to the dream-traipsing in Dreamscape, but the way Christopher Nolan uses them in a pragmatic space takes it all to a completely different level. The film's structure is both mechanical and deft as a result, much like Nolan's directorial talent, mirroring the heist movie framework with a science-fiction keel. That feels like a purposeful decision, since the rhythm essentially guides itself while technical downloading of information backdrops the momentum. If you've seen movies like Rififi and Heat, you know what's coming -- Cobb accepts the job, he and his crew will design an elaborate, absorbing heist studded with trepidation and character development, and then the heist itself will play out before our eyes. It's what they're set out to do, and the space in which they orchestrate their caper, that renders Inception into a compelling piece of work. The clock's running against Christopher Nolan, allotting him two-and-a-half hours to assemble a cohesive, reasonable environment where dream intrusion and manipulation actually makes sense. He's got to formulate rules and boundaries, or the brainstorming he executes around the heist will be for naught without an anchor to latch onto. Alas, there aren't many other ways for Nolan to do this outside of explanation, the dialogue between characters -- especially among Cobb and protégé dream "architect", Ariadne (Ellen Page) -- sketching out this intricacy. This results in a copious amount of captivating yet seemingly endless detail-hammering that does a great deal of "telling", without much of a break. As a director, Nolan could've either extended the film into a massive, character-driven sci-fi marathon in the vein of Andrei Tarkovsky's Solaris to break up the expounding, or stay concise, mechanical, and verbose while he sprints to the heist. He opts for the latter, and Inception's more accessible and brisker-paced because of it. Nolan sacrifices deeper emotional connection with his periphery characters though, leaving them as shallow chess pieces maneuvering around the board of Nolan's design. However, it's unjust to deem Inception expressively cold or inert because of this, since it's such a concept-driven film that does, in fact, have an affective core -- in the form of Cobb's tormented psyche. 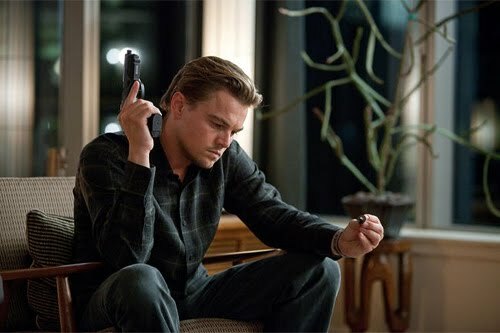 Powered by a charisma-driven performance from Leonardo DiCaprio, Don Cobb does turn into the sole emotional anchor in the film, using his distressed relationship with his wife and children as an emotional thrust. There are secrets to be discovered in Inception that revolve around this, ones that are peppered throughout the flow of technobabble and mounting anticipation, and it'd be unfair to reveal any of these. However, the process of him trying to hold onto encouraging memories of his wife and kids, as well as growing agitated when she invades his dream space, taps into a deeper meaning than it's likely going to receive credit for. Marion Cotillard stuns in this role, a scornful yet somehow affectionate shade of Cobb's wife. When you see exactly how Inception snaps together into a reality-bending, brilliantly airtight union of dreams, psychics, self-assuring totems, and the principles behind planting ideas, all encapsulated within an exhilarating heist, the sheer potency behind Nolan's orchestration will hit you like a sledgehammer. It transforms into a huge, gyrating puzzle that's both mentally-challenging and easy to follow, orchestrated with layer upon layer (upon layer) of the science-fiction design interconnecting before our eyes, ratcheting up the tension incrementally as more details cascade over the situation. More importantly, all the complexities within Nolan's construction feel sinuous and levelheaded, quite a feat for a film that exists in a place where buildings can fold atop each other like a map and skilled counterfeiters can take on the visage of other people. This is modern science-fiction at its more skilled and spellbinding, one that blurs the reality-fantasy line in a way that's both believable and not to be believed. When a haphazard train destructively barrels through Cobb's dream world, you understand -- and feel -- why. 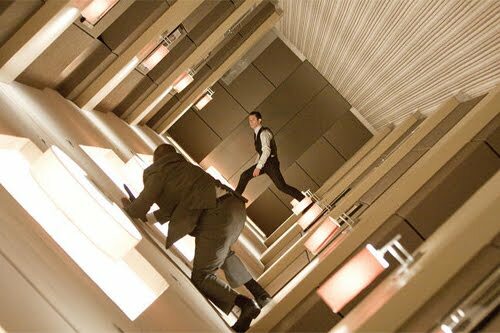 Inception concocts a robust aesthetic marriage between whimsy and metropolitan practicality that's ceiling-to-floor stunning, captured by cinematographer Wally Pfister's brisk, industrial eye and fueled by Hans Zimmer's momentum-driven score. Nolan and editor Lee Smith have grown extensively in the editing room since their first foray in the Batman series, allowing blistering car chases, trippy hand-to-hand upside-down brawls, and vigorous fire fights to linger -- though a few scenes, especially the grand snow-laden climax, still jerks around with reckless abandon. The music shifts right along with the momentum of the film, starting off similarly to Zimmer's work on The Dark Knight with some delicate, rhythmic notes and then ramping up into a "BRRAWWWMMM"-heavy fury of energy. Though Nolan's writing claims the lion's share of the responsibility for the polish, it wouldn't be possible without pitch-perfect visuals -- both photography and seamless CG -- and sound design powering it forward. If anything, Christopher Nolan's skill in crafting mysteries has made him a master of the "red herring", that little detail -- or details -- that sends speculative puzzle-solvers in a tizzy trying to decipher a meaning to it all. Since the majority of Inception takes place in the space where dreams are built, it's safe to say that the setting's rife with possibilities. I've said it before about science-fiction works, and I'll say it again: the best of the genre works on two levels, one that's straightforward to digest on a surface level and another that puts out as much intellectual complexity as the viewer puts into it. The last, gasp-worthy moment in Inception does exactly that, causing its audience to question whatever answer they've arrived at when the credits roll. On its own, without the labyrinthine speculation, Christopher Nolan's film delivers an exhilarating science-fiction experience that manipulates our perception of our dreams; but with this added game-changer at the close, which lures the viewer into a web of uncertainty and beguiling guesswork, it transforms Inception into one of the year's best pictures.